Look great, smell wonderful, and feel good as you make your own homemade natural body care products. 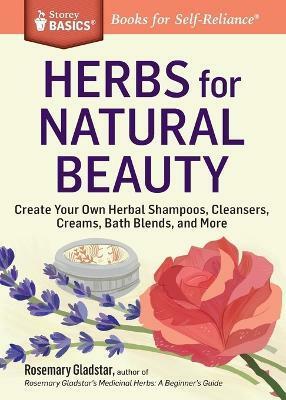 In this Storey BASICS(R) guide to holistic beauty, Rosemary Gladstar shares more than 30 simple recipes for cleansers, moisturizers, and creams comprised of essential oils and herbs. Make unique shampoos for lustrous, fragrant hair and learn Gladstar's amazing five-step system for glowing skin. Skip the harsh commercial ingredients and use nature's closet to keep your body healthy and beautiful. Discover the intersection of beauty and health with simple, all-natural body care. Best-selling author and respected herbalist Rosemary Gladstar shares over 30 recipes using herbs, essential oils, and other common ingredients to create gentle and effective treatments for your whole body, from head to toe. With cleansers, steams, toners, creams, serums, elixirs, shampoos, henna coloring, and even a five-step skin care program, you'll have everything you need to pamper yourself and your loved ones and let your natural beauty shine. Rosemary Gladstar is the best-selling author of Rosemary Gladstar's Medicinal Herbs: A Beginner's Guide and Rosemary Gladstar's Herbal Recipes for Vibrant Health, which draw on her 40-plus years of experiences studying and teaching about the healing properties of herbs. She is a world-renowned educator, activist, and entrepreneur, and the founding director of Sage Mountain Herbal Retreat Center, the International Herb Symposium, and the New England Women's Herbal Conference. Gladstar is founding president of United Plant Savers, a nonprofit organization dedicated to the conservation and preservation of native American herbs. She was the original formulator for Traditional Medicinal herbal teas and has led herbal educational adventures around the world. She is the recipient of an honorary doctorate from the National University of Natural Medicine in Portland, Oregon, and serves on the board of the Association for the Advancement of Restorative Medicine and The National Health Freedom Coalition. She lives in Vermont.